I know there were many posts on CH on this topic, but I still can’t navigate the site to find them. I have a friend who’s caring for her older mother. Her mother needs to eat more, more regularly. I’m thinking easy, frozen dishes are the way to go. My friend is not much of a cook, but is going to come here and we’ll cook together. I’m thinking about individual frittatas baked in muffin tins, hearty soups (ideas? ), breakfast burritos, maybe a homemade version of hot-pockets using that prepared crescent roll dough (ideas for fillings?). Was going to make a potato and leek soup “base” to which milk and stuff can be added (clams and clam broth, fish, veggies). Her mother is Mexican, but can’t handle any spiciness at this point - would love ideas for flavorful Mexican-ish dishes - does tamale pie freeze well? Can her mother do any cooking ie making sides? Or is she looking for ideas which cover the entire meal? Their favorite is “red” chicken. Its a dish my sister makes for them. I think it’s a sauce made with Catalina dressing and onion soup mix? Any how they love it. If her mother isn’t use to having frozen assets it might help to have an inventory sheet clipped to the fridge. My father would completely forget to look in the freezer. With a visible list he remembers more frequently. First - I only learned this in the last year or so, probably from someone on CH - teach her to use the defrost setting for reheating food. I find the food reheats evenly and is much more edible with this method. At this time of year I do a lot of freezable soups that can either stand alone or be served with a small salad. When my mom was living on her own, I’d often freeze single-portion containers of whatever I was cooking at home. I’m not sure that the crescent roll dough will freeze well…experiment. How often does your friend see her mother? If weekly, perhaps she can take some additions that won’t freeze well–say, noodles for soup as an example. Does her mom do any cooking such as boiling pasta to which she could add a defrosted sauce? To the other excellent suggestions I would add: mushroom barley, broccoli cheddar soups can be hearty and freeze well. Meatballs in red sauce or Swedish style. Mini-quiche or pot pie. I make these crustless quiches a couple of times a year. When one of our daughters had her last baby I baked it in a square pan, cut in squares and froze. Easy to MW. Read the Crustless quiche - two versions discussion from the Chowhound Home Cooking, Quiche food community. Join the discussion today. It’s not glamorous, but my go-to when trying to stock my mom’s freezer is seasoned ground meat (chicken, turkey, lamb). Easy to portion and cook in large batches (I freeze 3-4oz servings quart sized zip lock bags), and it reheats well (she usually takes it out of the freezer ahead of time so it defrosts). You are an awesome friend, ElsieDee. i do all kinds of pureed vegetable soups that freeze beautifully: sweet potato apple; broccoli cauliflower; tomato. i finish then with some coconut milk for a creamy texture. Tamale pie freezes fine, and would be perfect. Frittata mufffins are ideal, a whole bunch of those can be frozen flat and then xsfer to a big ziock bag to grab from. Muffin tins are also perfect for making individual sized meatloaf “muffins” too. If “mom” needs to gain weight be wary of lower calorie vegetable based soups that can be very filling yet low calories (like a basic tomato soup or carrot soup). A hearty bean chili can certainly be made without the heat. It’s my understanding that sometimes the mother can cook the sides - or even whole meals - but it sounds like it takes a lot of effort. One-dish meals are the way to go, I think. And my friend lives with her mother, so she can do some of the side dishes, too, but as I said, she says she’s not much of a cook herself - we’re going to work together on the basics. This is brilliant - thank you! I hadn’t thought about that (in fact, I’d forgotten that “defrost” was even an option!) - will definitely mention it. Are there any you particularly love? This may sound silly, but what do you recommend for freezable containers, @CindyJ? Do you have any favorite recipes for these, @Justlauralibrarian? I’m really interested in the enchiladas and the tortilla soup. I’m not sure that the crescent roll dough will freeze well…experiment. How often does your friend see her mother? I wasn’t sure about that either, @Gourmanda: do you have a simple recipe that might be a more sure bet (with the caveat that I struggle when working with pastry!). My friend lives with her mother, so she can certainly make some of the stuff needed to accompany meals. And I’d not thought about pasta sauce; that’s definitely going on the list! I make these crustless quiches a couple of times a year. These look perfect, @catholiver - thank you! I’m curious - how do you preseason them, @TheOracle? And what does your mother do with them? Another idea that I’d not thought about - thank you, @wonderwoman. Do you thaw and then reheat on the stove, or…? Not silly at all, @Ttrockwood! That’s something I’d definitely not think to do, but it should be done. Also, I’ve a question specially for you: I know you’re vegetarian - how would you (or would you) approach this project if you were cooking for an omnivore? Would you use meat substitutes, go vegetarian with dishes where someone wouldn’t expect meat, or cook meat? Elsie, look at www.puffpastry.com for ideas–especially their linch ideas. I think you can use that as a wrap or roll around, say, a meat and cheese filling. Should be okay to freeze the filled pastry and bake as needed. When it comes to enchiladas I don’t really have a recipe. I usually just whip up a quick enchilada sauce*, heat up some corn tortillas, dip them in enchilada sauce, fill with whatever leftover meat I happen to have (last week it was slow cooked pork), pour enchilada sauce on bottom of baking dish, place filled tortillas in dish, cover with more sauce and top with cheese, and then bake. For enchilada casserole I use the same basic ingredients, but layer them like a lasagna and sometimes add rice to the meat mixture. add rest of ingredients and bring to a boil. not sure if i’m replying in the right place, but. yes, i thaw the soup then heat on the stove top unless i’m at work, when i use the microwave. I don’t cook any omni proteins, I really haven’t the slightest what to do with them and would potentially poison someone! I avoid any fake meats myself for the most part and don’t use them cooking for omnis with the excellent of soyrizo from trader joe’s which is a universal love. 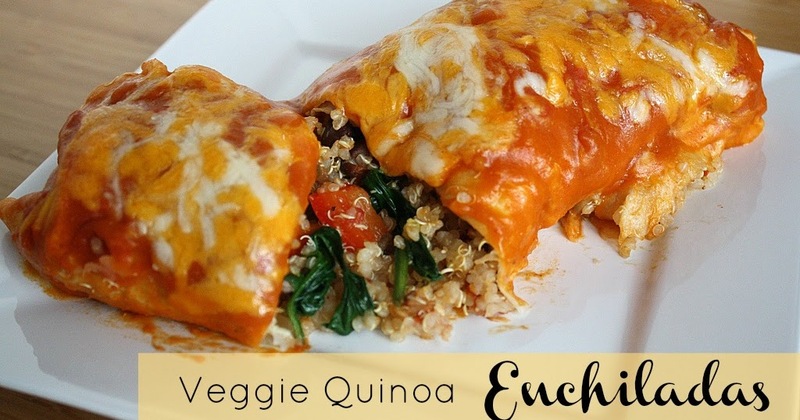 Vegan veggie quinoa enchiladas with homemade sauce! I’ve also made these hearty lentil walnut meatless balls (yet never the sauce), just use an egg instead of the flax. I used canned lentils once and they worked great! let the mixture rest at least an hour in the fridge before shaping into balls Bake before freezing. They’re great as is for a snack, or with some tomato sauce and veggies or pasta. I’ve been thinking about the hot pocket idea. I am skeptical about freezing crescent roll dough. One option would be to freeze the filling and keep a mini can of crescent rolls in the fridge. I know wonton skins and flour tortillas fare well frozen - perhaps experiment with them? A firm polenta should freeze well and could be used as a base or topping for casseroles/pot pie type things. Almost all winter there will be pints/quarts of a bean, tomato, spinach, & sausage; a minestrone with the pasta cooked/frozen separately; and a beef barley with lots of veggies. One of the three is almost always acceptable with good bakery bread when a household in my community needs a hand with dinner and much loved by the DH when I am out at a week night meeting. Chicken Broccoli Cheese casserole. Bake it, put in individual servings and freeze. Works well. I often did this one because my family member happened to love this particular casserole. As I said, it freezes well and works, but I came up with a better idea that I think tastes better and isn’t “leftovery”. The recipe calls for diced cooked chicken, lightly steamed broc,one can broccoli soup with 1/3 cup milk mixture, cheddar cheese and a topping of bread crumbs and butter. In each container put a layer of steamed broc, then some diced chicken, pour some of the soup mixture on that.Then, top it with shredded cheddar. Sprinkle some of the melted butter/breadcrumb topping. It tastes good and doesnt have that leftover casserole taste, and the broccoli isnt mushy.